An OCCC student from India will team up with an Iowa State University engineering professor to tour the most prominent colleges of India, speaking to students, teachers and government officials. 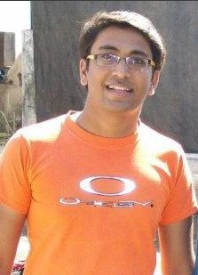 Akash Patel is a promising young motivational speaker from Nasik, India, according to an article in the Ames Tribune. Patel said he recently transferred from Iowa State University to OCCC. He will accompany Carolyn Heising, an Iowa State engineering professor and nuclear scientist who worked as a federal engineer under the Clinton administration. Heising has also served as a goodwill delegate to many countries, Patel said. He said the trip to India is more of a business and government trip than anything else, but it is also educational, because Patel will be running youth motivation workshops at the universities, colleges and schools they visit. “The plan was that Dr. Carolyn and I visit eight major Indian universities, where she would discuss her work, and I would speak to students motivationally. Also, we plan to visit several other colleges and schools to hold workshops for students. Patel says that although the combination of a motivational speaker and a nuclear engineer may seem odd, it came about through friendship. “Dr. Carolyn has always had an interest in Indian culture. She got to know my twin brother and I through our work and community volunteer activity in Iowa. And then she was planning a trip to India, and I was planning a trip to India, and it just went from there. The intrepid duo is left July 14 and plans to return Aug. 19, before the beginning of the school year.